ทั้งสามระดับการศึกษาข้างต้น อยู่ภายใต้การดูแลของโครงการธุรกิจอสังหาริมทรัพย์ ที่มีวัตถุประสงค์เดียวกัน คือ ผลิตบุคลากรที่มีคุณภาพทางด้านธุรกิจอสังหาริมทรัพย์ โดยมีคติประจำโครงการว่า "Real Knowledge For Real Estate"
Real Estate Business Program (REBP) is a part of the Faculty of Commerce and Accountancy, Thammasat University. There are three degree programs under the REBP. Real Estate Business Program originated from the Graduate Diploma in Property Valuation Property Valuation Program. GPV is the outcome of three important institutes' Co-operation. 1) Faculty of Commerce and Accountancy., Thammasat University. GPV is financially supported by World Bank. The Objective in creating GPV was to produce qualified personels in the valuation field that meet international standards. The Program started in the year 1996 and is an one-year program. The reason behind selecting GPV to be the first program in offer is because it is the fastest program in producing graduates when compared to BRE or MRE. Three years later. BRE was offered. But because Students are allowed to choose their major in their second year, therefore, the actual course starts in 2001. And in this same year MRE was offered. There are three concentration streams offered in MRE. All of these three-degree programs are under on big umbrella, Real Estate Business Program (REBP) with objective of producing quality graduates for the society. 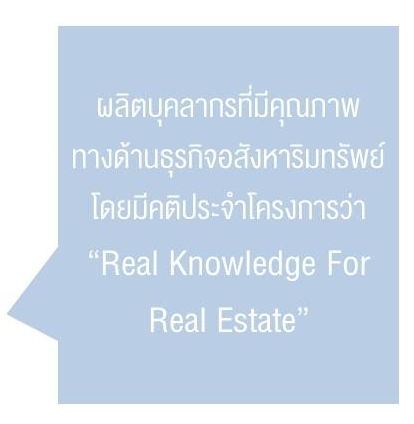 REBP has moved itself in this creation with the following motto: "Real Knowledge For Real Estate"